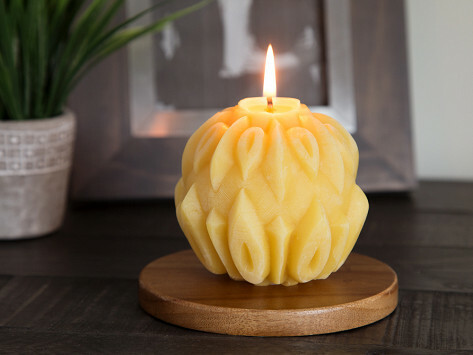 100% sculpted beeswax candles. All-natural, non-allergenic, and soot-free. Burns cleanly for over 40 hours. Dimensions (in packaging): 4" x 4" x 4"
i was looking for a "non-smoky" candle. My husband is tired of repainting our ceilings due to the dark spots above the burning candles. This> This fit the bill perfectly, and was simply beautiful to boot! Founder Brent Roose began making candles all the way back in 1993, inspired by gazing up at the Big Dipper in the night sky. He’s still working with beeswax today, and pitches in to help support sustainable beekeeping, too. We think that’s the bee’s knees.